From the end of the tenth till the beginning of the twelfth century coins were minted in the city of Tiel. They where struck by the Holy Roman kings/emperors Otto III, Henry II, Conrad II and Henry III and IV. Otto III was the son of emperor Otto II and Theopano from Greece. He was king and emperor from 983 to 1002. His knowledge was much greater than that of his forefathers; he was called "mirabilia mundi", the miracle of the world. 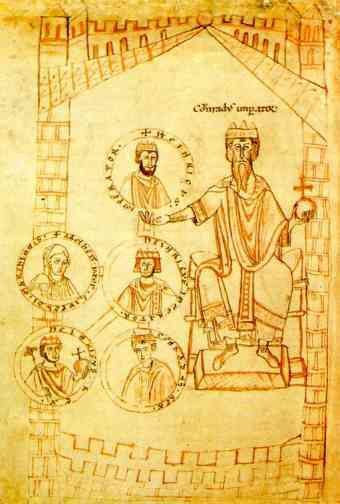 Gregorius V crowned him emperor. He died when he was 22 years old in Italy; at castle Paterno. His body was transported to Germany and buried in the chapel of Charlemagne in Aix-la-Chapelle, today's Aachen. Only one coin type with Otto's name is known from Tiel, minted during his kingship. Both sides of the coin show a cross and the text reads TIOLA. This coin is known in literature as Hatz 1 and Ilisch 3.1. 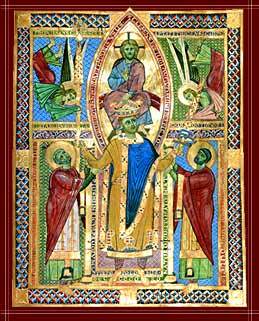 Henry II the Saint, last of the Saxon dynasty of emperors, was born in 972 in Hildesheim. In succession to his father he became Duke of Bavaria in 995. Ascended to the throne of Germany in 1002. He was crowned Holy Roman Emperor in 1014 by Pope Benedict VIII. He and his wife Cunegunda founded several bishoprics. At the age of 52 Henry died at the Palatinate Grona (1024); and was buried in Bamberg. 122 years later in 1146 he was canonized by Pope Eugene III. Henry minted several coin types in Tiel. During his kingship coins with S COLONI A (Hatz 2, Ilisch 3.2) and TIELE (Hatz 19 and 20, Ilisch 3.4 and 3.5). The latter was also struck during the time he was emperor; reference Hatz 15 and 17 and Ilisch 3.3. Also several imitations of coins of Tiel are attributed to him. 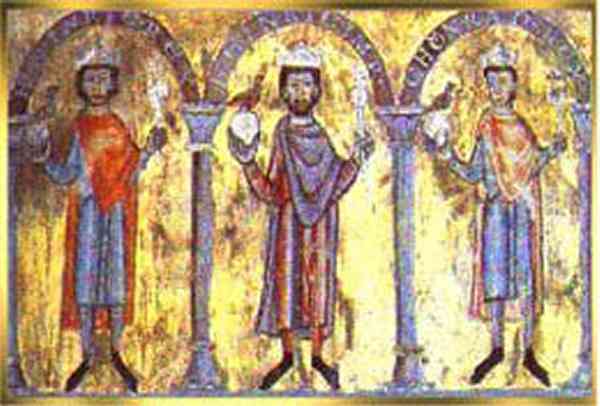 Picture: Henry II, as king crowned by God. Two angels holding the Holy lance and sword while his arms are supported by two saints (Ulrich of Augsburg and Emmeram of Regensburg). Conrad II the Salian was born in 990 as son of Henry of Worms and Adelheid of Metz. He became king of Germany in 1024 and a few years later also of Italy and Burgundy. In 1027 Pope John XIX crowned him emperor. The name of his wife was Gisela. It was not easy for him to keep peace in his kingdoms. During Whitsun 1039 he died in his sick-bed in Utrecht. He is interred in the cathedral in Speyer. This type also exists without his title as king or emperor. (Hatz 32 and 42; Ilisch 3.8 and 3.10.1) also bears no titles. This also counts for the name-giver of this site, the coin with BO xTIELE NA. Several imitations of coins of Tiel are attributed to Conrad. Some of them bear his title "imperator", which means emperor. Picture: Sitting on his throne, Conrad II holds the orb in his left hand and an inset with the picture of his son Henry III in his right hand. Underneath that we see Henry IV with three of his children. 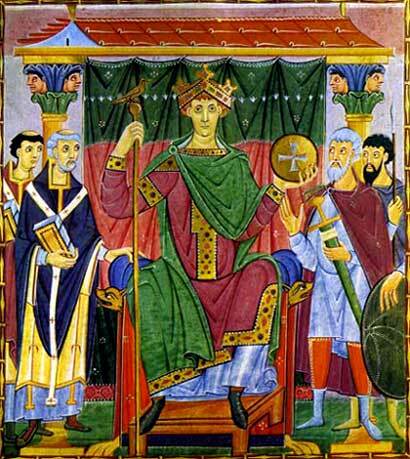 In 1039, at the age of 22, Henry III is crowned king of the German Empire. He deposed the rivaling Popes in Rome and appointed bishop Suidger of Bamberg as Pope Clemens II. The latter crowned Henry emperor in 1046. Gunhild, his first wife, was the daughter of Vikingking Cnut. His second wife Agnes of Poitou gave birth to 7 children. He fought simony; the deliberate intention and act of selling spiritual goods so connected with the spiritual that they cannot be separated from it. Henry died in 1056 and like his father buried in Speyer. Some of his coins of Tiel with BO xTIELE NA bear the title of emperor (Hatz 14, Ilisch 3.15) and others do not (Hatz 10, Ilisch 3.14). 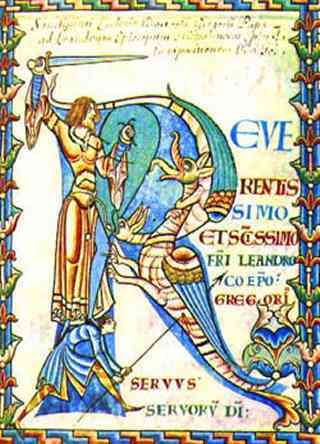 Picture: Henry III, symbolicly fighting simony. Picture: Henry IV with his sons Henry V	and Conrad. Henry IV was 6 years old when he succeeded his father Henry III in 1056 as king of Germany. Till 1065 he was under the tutelage to his mother; after that he became independent. He faught the War of the Investitures against Pope Gregory VII and his successors and was excommunicated. He appointed Clement III as antipope and the latter crowned Henry emperor in 1084. His son Henry V captured his father but emperor Henry escaped and died in 1106 in Liège. Only in 1111, after he was no longer excommunicated he was buried beside his Salian forefathers in the cathedral in Speyer. Only one coin of Tiel bearing his royal title is known: with TIELA CIVITAS (Hatz 57, Ilisch 3.21). No coins with the title of emperor are known. But there are coins of Henry IV without his titles. First there is a coin with the same text as before (Hatz 60 and 62, Ilisch 3.28). Next is the type withTYEL, registered by Hatz as number 38, 58 and 59 and by Ilisch as number 3.26. Interesting is the coin with a blessing hand surrounded by TYLA (Hatz 64, Ilisch 3.32). Finally there are coins of Henry IV with a head "en profil" instead of the familiar head of Tiel "en face". There were only silver coins struck in the denominations named penny and half a penny; which were mainly produced for trading with England and the countries surrounding the Baltic Sea. 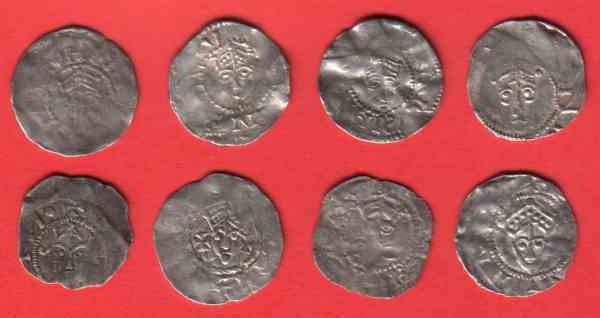 Especially in Sweden, Russia and the Baltic States many treasurefinds contain coins of Tiel among other "German" coins. On average 5% of the coins in these treasurefinds were struck in Tiel. The size of the coins is in general about 18 mm. and the weight is between 0,7 and 1,5 grams. The characteristic obverse of the coins looks almost always the same: the so called "Head of Tiel". This is the crowned head of the king or emperor in full face (en face). Surrounding the head you should read the name of the king or the emperor, but most of the time you are not able the see the complete text. Some obverses show a head looking to the left or right and sometimes extra marks are made beside the head. The reverses of the coins show a lot more variety than the obverses. This picture shows a coin of Henry II as emperor (1014-1024), around his head you can read "HEINRICVS IMPERAT" (Emperor Henry). On the reverse you find the text "xTIELE"; surrounding a cross with four dots between the legs. Similar coins also have little circles between the characters. The letter "z" above the two connecting lines between the obverse and the reverse means that the coin is made of silver (in Dutch: zilver). The next coin was struck by Conrad II (1024-1039). We cannot tell by reading the text whether it was struck during the time he was king or the time he was emperor. On the obverse there is only the text "xCVONRADVS", reading anti-clockwise. There is no "REX" for king or "IMPERAT" for emperor added. This reverse shows the text "BO xTIELE NA", this means that this is a good coin of Tiel. One should read this text as "BONA TIELE", like the name of this website. The text on this is "S COLONI A", the so called Colonia-monogram. In this case this side of the coin is an imitation of a penny of the German city Cologne. Many minthouses have placed the Colonia-monogram on their coins; only the coins with a matching "Head of Tiel" on the obverse are struck in Tiel. Besides the three pictures shown of possible reverses, there also exist coins of Tiel with a hand or a totaly different text on it. Above I have given a good view of how the coins where meant to look. In practice however, the coins almost never look like the drawings above. I shall now show some photos of the obverses and reverses of the coins of Tiel to show how they really look. You can find more photos of coins of Tiel in the section "Coin Gallery Tiel".